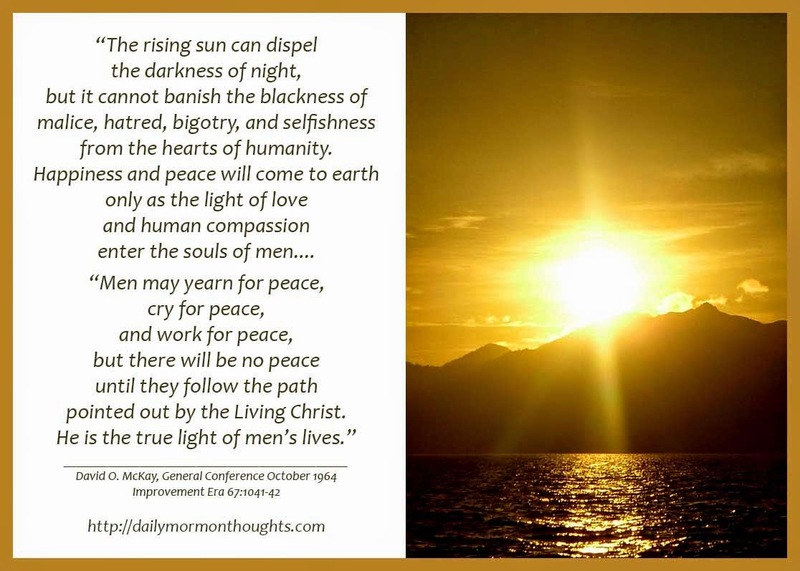 "The rising sun can dispel the darkness of night, but it cannot banish the blackness of malice, hatred, bigotry, and selfishness from the hearts of humanity. Happiness and peace will come to earth only as the light of love and human compassion enter the souls of men. "It was for this purpose that Christ, the Son of righteousness, 'with healing in his wings' (Mal. 4:2), came in the Meridian of Time. Through him wickedness shall be overcome, hatred, enmity, strife, poverty, and war abolished. This will be accomplished only by a slow but never-failing process of changing men's mental and spiritual attitude. The ways and habits of the world depend upon the thoughts and soul-convictions of men and women. If, therefore, we would change the world, we must first change people's thoughts. Only to the extent that men desire peace and brotherhood can the world be made better. 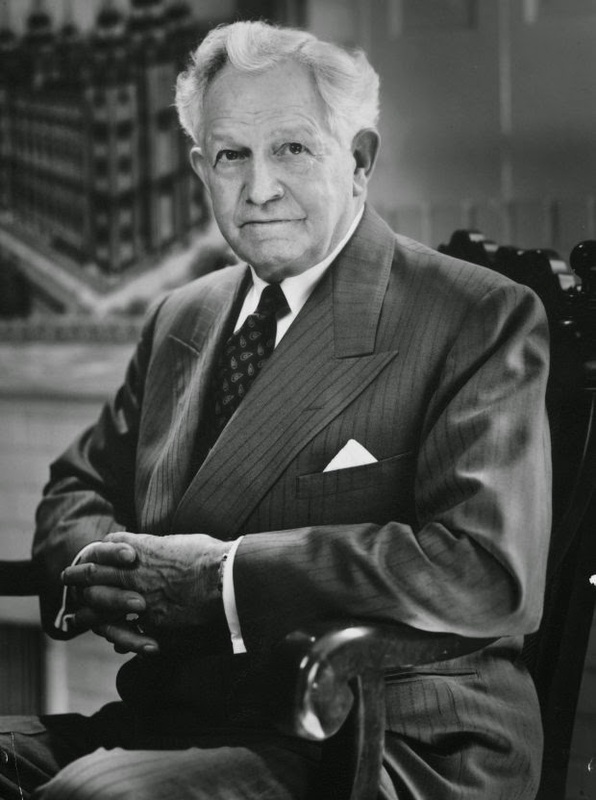 No peace, even though temporarily obtained, will be permanent, whether to individuals or nations, unless it is built upon the solid foundation of eternal principles. "Men may yearn for peace, cry for peace, and work for peace, but there will be no peace until they follow the path pointed out by the Living Christ. He is the true light of men's lives." It's been over 50 years since President McKay warned about "the blackness of malice, hatred, bigotry, and selfishness" that plague our society. Those times seem so simple in comparison to today's world! But the remedy hasn't changed, and never will. The quest for peace, in society and in individual lives, is as old as history. 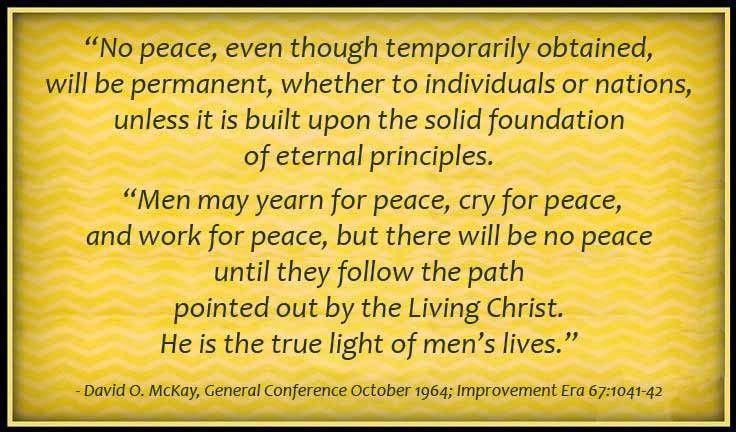 President McKay is clear to point out that there is only one source of true peace.